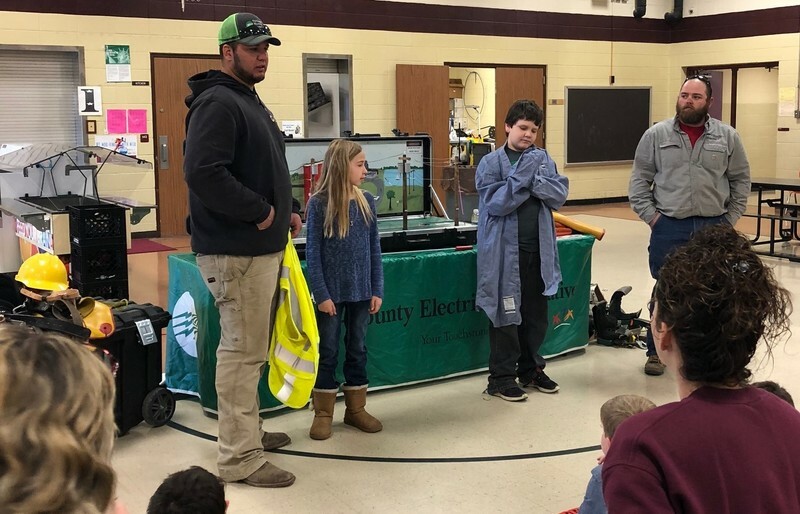 Tri-County Electric Cooperative (TCEC) sponsored an electrical safety demonstration on Friday, April 20th for the fourth-grade class of Schuyler County R-1 Elementary. 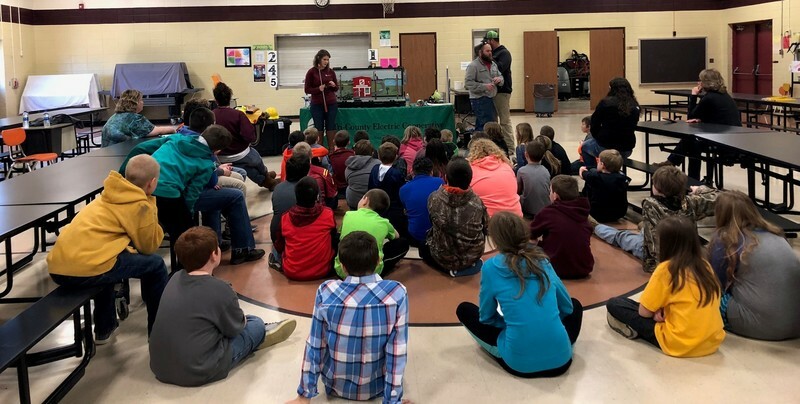 The presentation was conducted by Journeyman Linemen, Chisom Darnell and Dalton Smith, as well as, Allie Shetler, Member Services and Communications. Tri-County’s unique table-top display unit fascinated the young audience and sent students away with a much greater respect for electricity and the dangers associated with it. Students were taught how to react quickly and safely in various emergency situations involving downed power lines. The cooperative warned the audience that if they are ever in an accident involving a power pole, they should assume electrical lines could be down and energized. The proper action is to stay inside the vehicle until the power company can de-energize the line. Stepping out of the car could create a path to ground and kill a person instantly. The only exception would be if the vehicle was on fire. In that case, the proper action is to jump – not step – with both feet together away from the vehicle, making sure you are NOT touching the vehicle with any part of your body when you land. Darnell and Smith reminded the students to never climb trees near power lines, never play on transformers and to keep kites, balloons, and other objects clear of electrical lines. 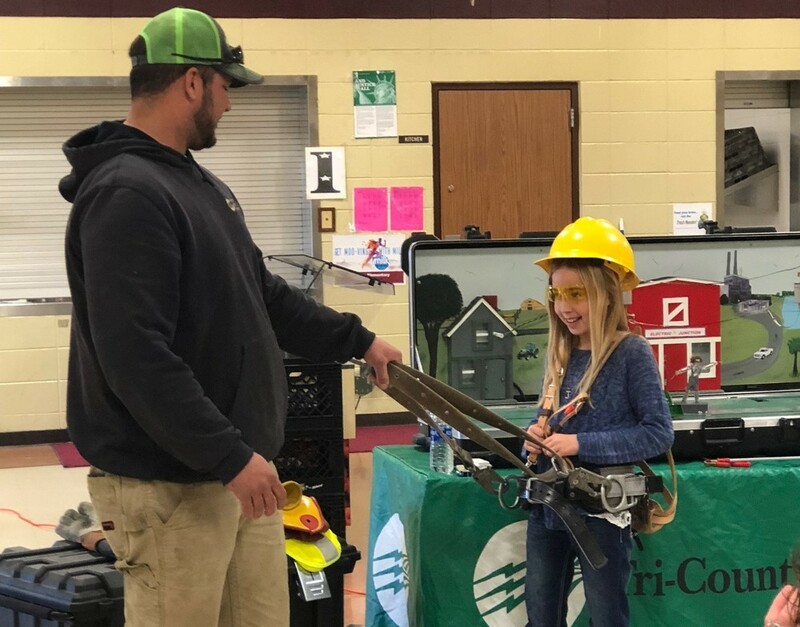 The elementary safety demonstrations provide children with a solid foundation for electrical safety knowledge and helps them to be aware of the dangers associated with power lines. Tri-County Electric Cooperative is pleased to sponsor this program for any elementary school in or around TCEC’s service area. For more information on these demonstrations, call Tri-County Electric Cooperative at (660) 457-3733.